The assignment : Cortex worked closely with Squeeze to develop a mobile game, based on the eponymous show on the Teletoon network, where the player becomes Ed the unlucky bird. Cracké, developed by Squeeze Studio Animation, features a daddy ostrich protecting his beloved brood of eggs which is in perpetual need of rescuing. The concept spawned the project to develop a mobile game for fans to have fun with the famous bird. 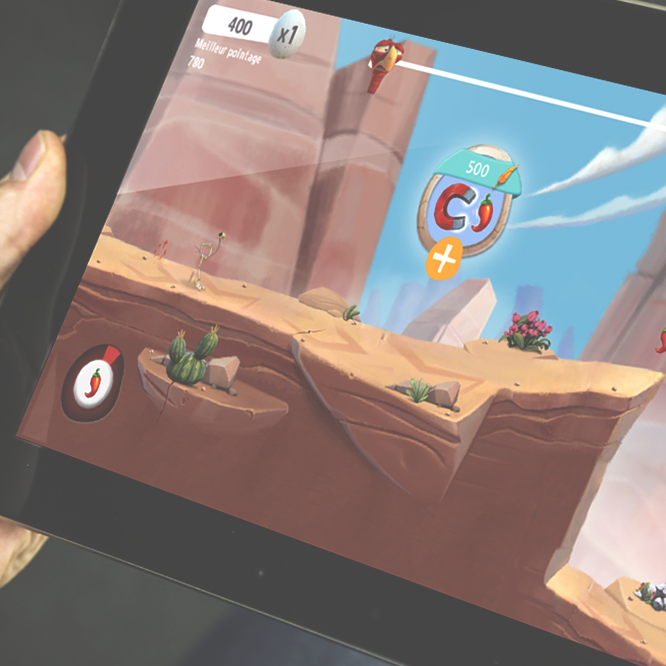 Cortex worked closely with Squeeze to develop a mobile game, based on the eponymous show on the Teletoon network, where the player becomes the unlucky bird. The endless runner game drops players into the crazy universe of Cracké, a world littered with peppers that give energy to run faster, feathers to catch, and obstacles to avoid as part of the mission of never loosing the eggs. The talented Cortex team remained faithful to Cracké's well-established image by developing a high-quality game with simple, intuitive gameplay. With its sights set on the global market, the Cracké Rush story is just getting started!